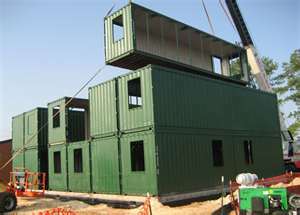 In this section we will cover the major aspects of building with shipping containers. We will go over the steps you need to complete before you actually begin to build your house, garage etc. 1. Search for a place to buy new or used containers. Use the Internet and the local classifieds to accomplish this. Keep in mind transportation and handling issues; you will need to arrange to have the container(s) brought from the point of purchase to your location. Shipping container house under construction. 2. 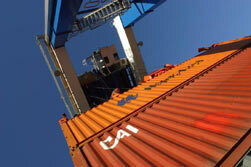 When searching for cargo containers, you must take into consideration transportation and handling issues. The closer to your location the better. Distance and complicated logistics add to the expense of the container. If you're looking at a $3000 container, an additional $600 in shipping or transport represents an overall increase of 20% to the cost. The transportation and handling of the containers may involve the use of cranes, trucks and other heavy equipment. Some sellers will assist you with moving them to your desired location. Now you're the owner of one or more containers and you have moved them to your location. Let's start building with shipping containers! First you must build a foundation. Although shipping containers are very strong structures, you need a strong foundation for them. Another reason you need a good foundation is to prevent the corrosive effects of moisture over time. For that reason containers need to be set up above the ground level. 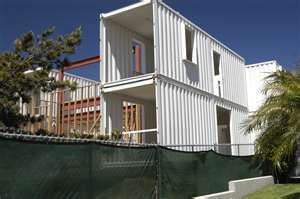 Shipping container apartment house being built. The next step is to cut the corrugated steel sides of your shipping containers for the installation of doors and windows, then install the doors and windows. Because the containers are made of steel, and steel is a very good thermal conductivity material, you don't want to cook in the summer and yourself in the winter. A very important step now is to insulate the interior of the container and there are different techniques and materials to do that. Finally, you can build exterior decks, supports and the roof. This is a basic overview of the steps you must follow for building with shipping containers. We don't go into specific detail because they can vary depending on location, type of construction, etc. In the near future we will be posting more detailed information on each process. Shipping container structures come in all shapes and sizes. This is an overview of the process for locating used shipping containers online. Transportation and handling issues you should consider when searching for shipping containers available for sale. 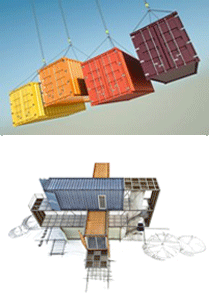 Information about container dimensions used when building with shipping containers. 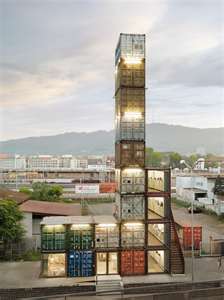 Architect Mark Strauss specializes in converting shipping containers into stackable living units.